Why Students should go for real time PHP Internship Training ? PHP stands for Hypertext Preprocessor. It is an open source, server-side, scripting language used for the development of web applications. Now a day’s considered as one of the best in Content Management system based on website development. PHP community keeps on working hard to make PHP development tool more user friendly and popular. 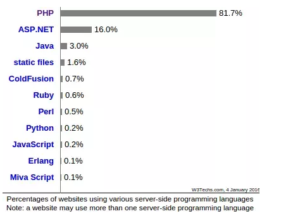 Below figure specifies the usage of PHP in developing websites. PHP is the most popular server-side scripting language and its usage is increasing every day. PHP is used by many websites but with lower traffic than other server-side languages. PHP based Content Management Systems usage is increasing. MNCs like HCL, Infosys, TCS, Wipro, Accenture, Cognizant are also using PHP. PHP Internship in Chennai, provides a practical experience for the students on the latest and advanced technologies. The following are some of the Top jobs in the IT Industry. KaaShiv Infotech offers PHP Internship for students and Enhance the students for the above said skills / job roles from basics to Advanced through our specialized PHP Internship programme. Student will be specialized in PHP Basics and Advanced, Applet Programming, Mysql Programming and PHP Mini Project. Students will be getting trained in / writing 40 Programs – Will change based on the duration’s of the program.